Osprey Publishing is well known for their history books. What is not well known in most gaming circles, is they also have an excellent, and ever growing, line of both fiction and gaming books. 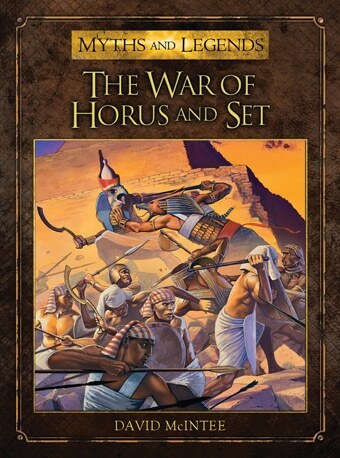 In this review, I am looking at a book from the Myths and Legends series: The War of Horus and Set by David A McIntee. The Myths and Legends books are not your average fictional tale. What makes them special, is that they still have some Osprey DNA and go into the non-fictional history behind the tale. It’s this entwined mix that makes for a very excellent read over just reading the legend itself. The War of Horus and Set recounts the famous ancient Egyptian mythological story of a godly royal family betrayal and the subsequent vengeance fueled battle to reclaim the throne. The first chapter of the book is “The Gods and Their Realm”. This section is all the backstory to the war. It talks about the family history and important related Egyption mythologies. It also introudces the main characters of the story. This story has Ra (The Sun God), Osirus (Horus’s father and god of the Nile), Isis (mother of Horus and Queen of the heavens), Thoth (god of wisdom and writing), Nephthys (sister of Isis and the original preistess), Anubis (god of mummification), Set (younger brother of Osirus and a god of the desert, storms, and warfare), and of course Horus (the god of the sun, war and protection). There is a lot of cool information in this chapter and a quick primer on important Egyptian deities. The second Chapter is “The Jealous Brother”. This section continues the backstory, but focuses on the events right up to the War. It discusses the king Osiris, the maneuvers of Set, the birth of Horus, and the ultimate betrayal. Chapter three is “The Vengeful Nephew.” The section is the heart of the story. It is the rise of Horus and his ultimate battle versus Set for the throne. I really don’t want to ruin the story for anyone, but lets just say that my favorite part was Isis searching the countryside for body parts, collecting them, and reassembling them for a purpose. Yes, we have a Dr. Frankenstein like zombie in ancient Egypt! Chapter four is were the Osprey DNA really starts to leak into the book. This section, “History and Warfare,” talks about how the legend has shaped and changed over time due to historic events. It also discusses the weapons and tactics in Ancient Egypt. This small chapter is packed with useful tidbits of true history. Chapter Five is “Enduring Legacy.” This section talks about how this legend was important in Egypt, both an ancient times and now. It also briefly discusses the legend’s effect on popular culture, such as Stargate, Dr. Who, and the novel American Gods. All in all, this is an interesting read in its own right. This would also make an excellent companion for any roleplaying game set in Ancient Egypt. Pick this up if you play games like GURPS: Egypt form Steve Jackson Games, Egyptian Adventures by Green Ronin, Osirion, Land of Pharaohs (Pathfinder) by Paizo or Gary Gygax’s Necropolis for Dungeons and Dragons. The War of Horus and Set is available from Osprey’s website ($17.95 MSRP or $13.95 in ePub or PDF) or anywhere books are sold. Paizo’s Pathfinder Society Does Gen Con Right!